Fear of missing art? You’ve come to the right place! Join us on the last Saturday of the month when the Gallery’s Youth Collective presents a kaleidoscope of experiences to engage young people with art and ideas. FOMArt features a range of free events including interviews and talks with art professionals and artists, performances by young musicians, collaborative workshops… and more! Bring your friends, meet like-minded art lovers and ignite your imagination and creativity. This month, the Youth Collective are thrilled to host a 3-hour performance by Locust titled 4×4 . Accompanied by drummer Tim Bruniges, Locust will use the drum beats and drone soundscapes as a catalyst to further explore his practice while enduring the act of mark-making. Image: Locust Jones. Photograph: Silversalt. 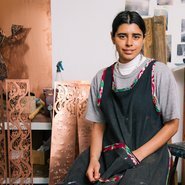 The Youth Collective speaks to female artists from culturally diverse backgrounds to discuss how they use art as a vehicle to explore their identity within Australia’s cultural landscape. Join this unique, youth-led discussion facilitated by the Youth Collective with panelists Australian-Lebanese artist Shireen Taweel and Australian-Filipino artist Marikit Santiago. Image: Marikit Santiago. Photograph: Alex Wisser, courtesy of Parramatta Artist Studios. Have you got something on your mind? Make a bold statement on your very own canvas bag using stencils, paint and markers in this workshop led by the Gallery’s artist educators. This workshop is open to people aged between 15 and 25. All levels and abilities welcome.